What was going to work for me! I have spent a lot of time over the last year looking at personal terrain projects on the internet. I had tried a terrain mat and found it was not to my liking. I liked the continuous sweep of the landscape, but disliked modular road and rivers. I also found that modular hills did not seem to work well either. They just do not connect to the terrain itself. At the same time, I wanted something flexible which could be changed about easily. I have had some experience with terrains as I built the below terrain for my son's GW Lord of the Rings figures about 8 years ago. It came out ok and at the same time I learned a few things. After looking at various materials, I decided to stick with styrofoam insulation. I took a lot of my ideas from Clarence Harrison's Quindia Studios, I just wish I was as skilled and painstaking in my work as he is. I like lightweight materials, so I used 1/2" insulation and 1/8'MDS boards. All my modules are going to be 2x4' or 1x4' in dimension. Liquidnails® was used to attach them together. Previously, I had used flock directly on the styrofoam and although that had worked ok I liked Clarence's idea of using terrain matting. 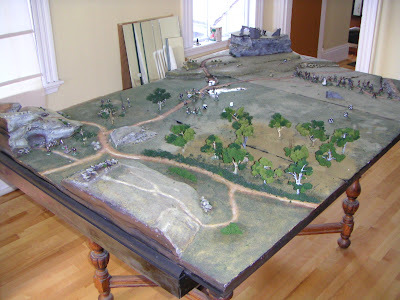 I used a Woodland Scenics® vinyl backed mat; it had some rigidity that I liked, but was also moldable using a heat gun. One of the biggest problems with modular terrains is that unsightly gap between the boards so I thought I would cut the terrain mat so it was 1/4" bigger on 2 sides then the underlying module. As you can see with the 2 boards in the foreground, they have been fitted together with a slight overlap of the terrain mat, thus easily obliterating the gap. The neat thing about using the vinyl product is that it's rigidity allows you to slide the 2 overlaps on top of each other. The trick is to glue the mat to the styrofoam with a gap of 1/2" from the edge of the board, this allows you slip the vinyl under each other. One of my modules had to have a hill, I wanted one that I could place a small village on or even a church. It had to be a also an impregnable redoubt that a small number of men could hold out against a much larger force. Something like in Sharpe! I took the 2x4' module and cut a second piece of styrofoam as below, I smoothed the edged with this neat tool I found at Home Depot. The terrain mat was then laid out on the original board and cut to shape. I use a combination of white glue and hot glue to attach the vinyl to the styrofoam. This holds it in place well, but is not a permanent bond, in case I want to change the position. A third board is then attached in a likewise fashion. I then start to build up the board using drywall compound. Push some different size stones into the wet plaster. I build up the road using wood filler as it is much more durable then drywall compound. Use white or PVA glue to bond the whole thing together. Let dry. Use the glue gun to attach some pieces of terrain (rubber walls). Do not worry about the gaps, as it will all come together. Let dry overnight. Paint the whole thing with the watered down burnt sienna (GW Vermin Brown). I use a cheap acrylic paints from an art store. Let dry well. It is shiny because it is wet. Heavy drybrush with yellow oxide (GW Bubonic Brown). Go out onto the terrain mat. Start adding a thin veneer of drywall compound to the road. Sprinkle sand into the the drywall. Paint the road only with burnt umber (GW Scorched Brown). Let dry over night. Now for the fun. Use an Earth Blend fine turf on the slopes of the hill and out on to the terrain mat. Work some Burnt Grass coarse turf into the bases of the walls, into the gaps between the walls and between the large stones on the slope. I used Yellow Grass fine turf on the summit. The flocks are all Woodland Scenics® products. Spray the whole thing heavily with very watered down PVA glue, make sure it dries clear. Detailed view of the road. Detailed view of the slope. Looks ok, I think. Rivers are what make a terrain for me. I just do not like the look of modular rivers laid on terrain mat. I use a product called Envirotex Lite®, it is a 2-part epoxy resin that makes superb water, it can be coloured and dries hard. As you can see below, 2 modules have already been built with streams. I want 2 basic layouts with streams on the terrain, one that cuts the terrain in half and the second that runs down the middle which forms a small island of land. Here is the first layout, as you can see I need to finish the 1x4' module (detailed below). The modular nature of the terrain allows me to move the river up and down the long axis of the table as need be, here it is in the middle. Here is the second layout with protected island. I use a propane torch to form the river bed, great fun! It gives a nice irregular rocky look. I next have to line up the modules so they will go together. I use tongue depressors glued to the styrofoam as an additional support. As you can see it is easily cut with a blade. Do not cut it though, until you have poured the 2-part epoxy. I again use wood filler to match up the modules. Sprinkle some large and small stones into and along the side of the river. Before you pour the water place some Burnt Grass coarse turf along the riverbank, and then spray with the watered down PVA glue before you pour the water, let dry. Mix up the epoxy well, add a tiny amount of colour (I used a dull green to make it murky) and then pour the epoxy into the river bed. If you want a rough surface run an old paint brush through it about 5-6 hours after it has been poured. It takes 24 hours to cure. You can do a second pour if you like. The match was not bad, although I would of liked the water on the right to be a little more murky. Well here is how it looks assembled, still lots of work to do, but a good start. I have used the yellow grass fine turf lightly sprinkled over the mat to blend things together, this makes a hugh difference as you can see. A look at the village on the hill in the far east of the terrain. A look at the farm house and orchard on the north of the river. Lots of command stands, but no troops!! I still need to figure out where the roads all go, this is complicated as they have to line up with multiple configurations of the modules. See here. I need to blend the terrain together a little better and work on the interfaces between each module. I also need to get the oak side rails of the table screwed on, the side pieces above are just temporary. I will post a final post, I hope within a couple of weeks. And finally, I need to read all those rule books I have obtained in order to figure out how to use all this stuff. Very, very nice work John. I especially like how you do your rivers. Hi John, Excellent Blog. The hill is superb and you've done a great job of describing its construction. Thanks, I will look forward to further entries in yors blogs. Thanks I just need to get those side pieces on. certainly like what you're stating and the way during which you are saying it. You are making it enjoyable and you continue to take care of to keep it sensible. I cant wait to read much more from you. That is actually a terrific website.